Hypoxia is the most common cause of injury; it occurs when lack of oxygen preventsthe cell from synthesizing sufficient ATP by aerobic oxidation. Hypoxia is the most common cause of injury; it occurs when lack of oxygen preventsthe cell from synthesizing sufficient ATP by aerobic oxidation. Major mechanisms leading to hypoxia are ischemia, cardiopulmonary failure, and decreased oxygen-carrying capacity of the blood (e.g., anemia). Ischemia, due to a loss of blood supply, is the most common cause of hypoxia, and is typically related to decreased arterial flow or decreased venous outflow (e.g., atherosclerosis, thrombus, thromboembolus). Pathogens (viruses, bacteria, parasites, fungi, and prions) can injure the body bydirect infection of cells, production of toxins, or host inflammatory response. Immunologic dysfunction includes hypersensitivity reactions and autoimmune diseases. Congenital disorders are inherited genetic mutations (e.g., inborn errors of metabolism). 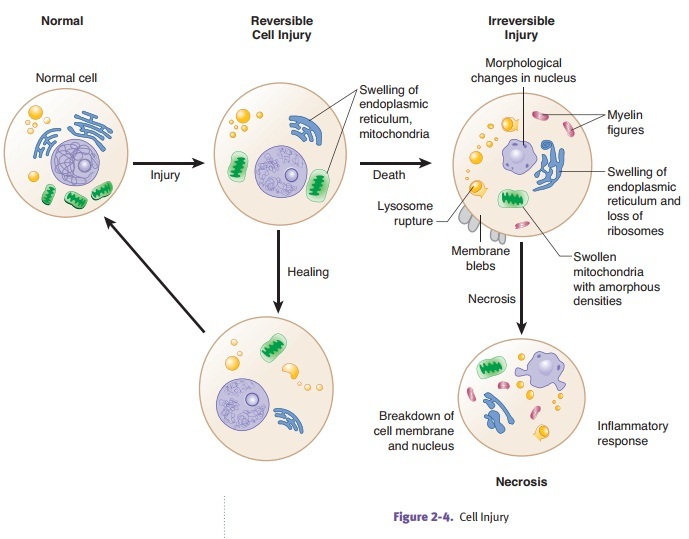 Physical forms of injury include trauma (blunt/penetrating/crush injuries, gunshotwounds, etc. ), burns, frostbite, radiation, and pressure changes. · Inadequate calorie/protein intake can cause marasmus (decrease in totalcaloric intake), and kwashiorkor (decrease in total protein intake). · Excess caloric intake can cause obesity (second leading cause of prematurepreventable death in the United States) and atherosclerosis. · Vitamin deficiencies can be seen with vitamin A (night blindness, squamousmetaplasia, immune deficiency), vitamin C (scurvy), vitamin D (rickets and osteomalacia), vitamin K (bleeding diathesis), vitamin B12 (megaloblastic ane-mia, neuropathy, and spinal cord degeneration), folate (megaloblastic anemia and neural tube defects), and niacin (pellagra [diarrhea, dermatitis, and dementia]). · Hypervitaminosis is less commonly a problem but can result in tissue specificabnormalities.